1.1 When was Emily created? Victor (full name Victor von Gerdenheim) was the creation of a mad scientist by the same name. However, Professor Victor Von Gerdenheim died shortly after giving life to Victor. Believing that if he proves that he is the strongest in the world, the Professor would accept him, Victor leaves the castle. 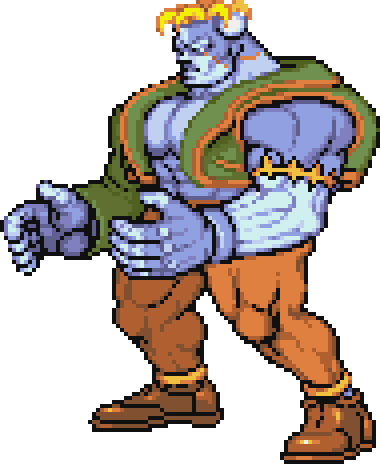 After Victor had fought many Darkstalkers, he came back to the castle hoping the Professor would accept him, but the dead Professor did not wake up. Instead, the prototype Emily, who was also Victor's "sister", welcomed him back. The two lived happily for many years until one night, Emily malfunctioned. Victor believed that if he collected many souls, he could revive Emily. He entered the Majigen to collect souls with this intent. In the end, he sacrificed himself by using all his powers to revive Emily. Every one of Professor Gerdenheim's research pursuits encountered some kind of humane or ethical problems. He was also marked as a dangerous man to the council of Medical Academic Research. His research on revival of dead cells was a completely new idea in the field, but was nothing more than a nuisance to those who lost their rights due to it. Although he was known as a "Mad Professor", people started spreading false rumours about him. Rumours that he was an inhumane, publicity chaser and even a drug addict. Because of these rumours, the public and the council were filled with suspicion and contempt. Due to the power of the council, his chances to speak in public were taken away as well. Soon, he was forgotten by society. Regardless, the Professor continued his research, but not for the prospect of fame. It was almost better that the public ignored him for his research. He moved his operations to a country town and spent his days in the underground laboratory. The creation of life was his ultimate inner-goal. According to his research, if he obtained the right materials and enough electrical power, he believed that he would be able to prove the validity his research. He used any measure to obtain the materials he needed. After moving into the laboratory, none saw him for over 20 years. It is believed that this isolation drove his mind into further madness, his sheer force of will alone made him march on and create miracles. For most of his later days in life, he spent his time experimenting on Victor. It was very difficult to read his research material when he was insane and many mysterious signs were used in his writings. This is the only legacy of the Professor who researched the creation of life that lies "Beyond the darkness". Before the Prof. went into his real experiment, he did many tests on human bodies. Emily was made as a prototype that couldn't generate electricity by itself and could only be activated once. 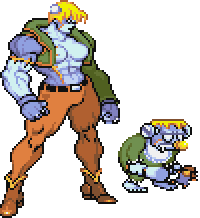 He failed many times over and over until he finally succeeded in animating Emily. But she was only a doll that moved by flowing electricity into her constantly. Her limbs could move temporarily and would only last for about 30 seconds. But this was still one step closer to his goal of creating new life. He began to design Victor who could generate electricity by itself and increased the size of the body to do this. It is still unknown why Emily can move like Victor after the experiment. Most likely, when Victor was created, a part of the large amount of electricity used to animate Victor flowed into Emily as well. She was able to store a vast amount of electricity in her due to an accident. Victor is the ultimate masterpiece that Prof. Gerdenheim left. These are the records left by the doctor to create Victor. Collecting human bodies for materials. The bodies are to be fresh as possible. To store vast amounts of electricity, the body is enlarged by combining human parts. Sewing up the bone, muscles and nerves. Transplanting a electrostatic organic material into the nerve and muscles. To re-animate the dead cells, this step cannot be missed. The manufacturing process of this material and its raw material is top secret. To soak the material in a special revival liquid and to wait for 200 hours at a temperature of -18 degrees or less. This process causes the material to not rot. To connect an electrode and a pacemaker with the involuntary muscle of the heart. This is to make the heart infinitely move. Circulating charged liquid (blood). This liquid was created by the doctor just like the revival liquid. It takes several years to create enough liquid for one human body. To stimulate it with a high voltage current. This is the problem that the Prof. ran into in the end. In one mili-second, 100 thousand KW must be sent into 20mm or more of a surface. Because he couldn't use a large scale facility, he had to rely on lighting for his source. At present, it is very hard to obtain these books. This page was last edited on 20 February 2018, at 02:57.